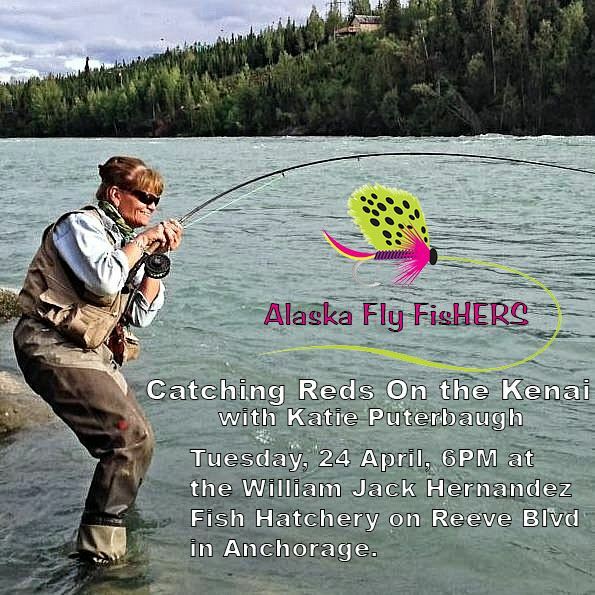 For the May’s General meeting, I have put together a panel of five Alaska Fly Fishers (AFF) members. The panel members are Bob Churchill, Jan Schnorr, Bob Wallick, JP Wood, and myself. I know over the years, as I string my rod for day on a stream, river, or lake, I have asked myself what are other members doing? When I am out on one of the local lakes, Jan Schorr’s and Bob Wallick’s names always come to the top of my mind. I keep running into JP on the Anchor or see the photos of the fish he has caught and released. As for Bob Churchill, I wanted a chance to listen to him and see what I could learn. For myself, how could I put a panel together and not be part of it. Looking at 40 minutes to provide information to AFF members and friends, we will not have a slide presentation. I have asked each member to speak for about 5 – 8 minutes about how they fish, where they fish, and any tips they may wish to share. Hopefully, there will be enough time to answer questions. I cannot guaranty that you will learn where anyone on the panel fishes. I know that it was impossible to get that information out of anyone when I asked them to take part in this panel. I do believe it will be fun and you will gain some experience from the panel that may have taken us years and few dollars to obtain. So bring your questions and lets have fun sharing information. Hopefully, it will become a Cub favorite meeting. For directions to the BP Energy Center, please see the Home Page. On April 23rd we will have the second session of the Spring Fly Fishing Seminar. Topic for that night will be Essential Flies to have and a demo of Fly Tying by members of the Club. Members - we need folks to come and tie some simple patterns to show the attendees. You don't have to be great - if you can tie something that catches fish, bring your gear! Contact Rich at Rich@2GuysFlyFishing.net to let him know you're planning to attend. Here are a couple of pics from Session 1. Great turnout! Everybody is practicing knots! Picking up the practice hooks. Careful!! The first session of our Spring Fly Fishing Seminar starts Monday the 16th at the BP Energy center. Click HERE for more details. As always, we need volunteers to help with the second half of the night which is about common knots we use in the sport. If you can come and give us a hand showing people some basic knots, it would be greatly appreciated. Please contact Rich at Rich@2GuysFlyFishing for details. Thanks to all of you who posted comments about the proposals for temporary Fish Camps and road creations on Lower Talarik Creek. The Comment period ended March 30th. The two Lower Talarik permit applications are still in the queue. We received a significant amount of comments during the comment period, so we will be addressing them has a team. As a result, it is difficult to put out an exact timeline, but we intend to have a decision out as soon as possible. We still have a few tickets for the Raffle! Don't wait too long!!! See Lance or Rich! Mat-Su Sportsman Show and the Great Alaskan Sportsman Show are over and we have already sold quite a few tickets for this raffle. But if you haven't gotten yours yet, don't despair! They will be available at the Monthly Meeting tonight (April 9th) and Lance and Rich still have some. Remember, we're only selling 200 tickets, so don't wait too long!!! This year we're doing something a little different. Instead of a Rod and Reel, we've decided to offer a FISHING TRIP!!! They are being offered at the Mat-Su Sports Show and the Great Alaskan Sportsman Show as well as our own meetings. The drawing will be held when all the tickets are sold and you do not need to be present to win! You can send a check made out to WSCFFI to Carl Johnson at PO Box 1206, Monroe, WA 98272. Email Carl at flyfishalso@frontier.com to let him know how many tickets you want, so he can set them aside. FYI: Alaska (and AFF) is part of the Washington Council of FFI (Fly Fishers International). Thank you, Mike Lindsey (Member at Large), for arranging the program. Brand new AFF member Melanie Whatley won the Grand Prize from the raffle. She was brought to AFF by Brenda Brown; need we say more? Thanks to Steve Johnson for filling in as Ghillie as Bob B was recovering from donating a kidney stone. Also, our thanks are extended to Randy Guintu for covering Fly of the Month for Kevin, and Stan Bissonette at merchandise for Steve Lambert.